Another Stonehaven FC cup tie fell victim to the weather this week as their Scottish Junior Cup Fourth Round in Glasgow was called off. Hive were due to play West Region Central District First Division leaders Rossvale at Petershill Park and travelled down to find out that their game was off due to bad weather. The game is scheduled to go ahead this weekend, Saturday, January 23. 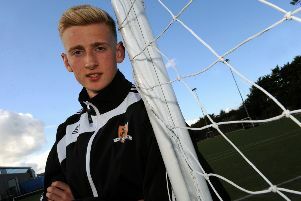 However it wasn’t all bad news for Hive as they announced on Friday that they have signed Cove Rangers and former Aberdeen youngster Lewis Dunbar on loan until the end of the season. Hive posted on their Facebook Page before the game was called off: “Stonehaven have today completed the signing of defender Lewis Dunbar on loan from Highland League side Cove Rangers until the end of the season. “18 year old Lewis who spent nearly 8 years with Scottish Premiership side Aberdeen before joining Cove Rangers in the Summer will go into the Hive squad for tomorrow’s ETHX Energy Scottish Junior Cup 4th Round tie away at Rossvale.